Report from a CNN reporter. Can we hope that this was either badly reported or a joke? 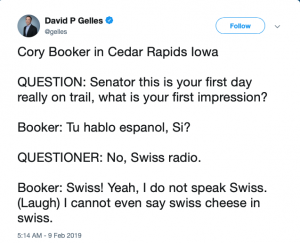 Bad Spanish, how do you mistake a Swiss reporter for a Spanish reporter and no, Swiss isn’t a language. But hey, he follows in the illustrious footsteps of Obama who thought Austrian was a language.